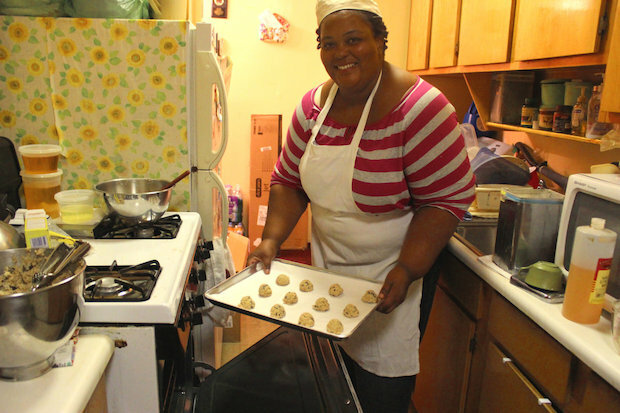 HARLEM — Tiffany Wright is going to wake up at 3 a.m. Friday and start baking. She won’t stop until 11 a.m. the next day. What's driving the 31-year-old aspiring chef's kitchen marathon is a chance to win the bake-off at this year's Harlem Harvest Festival on Saturday and have her chocolate chip cookies featured at a local restaurant. The idea behind the bake-off is to give local amateur chefs a chance to be recognized, said Nikoa Evans-Hendricks, the organization's executive director. Wright learned to bake from her father and grandmother. Her dad worked as a cook in restaurants around town and her grandmother, the president of her local tenant association, baked cakes for the community every chance she got. As a little girl, she was obsessed with cookies and loved to bake them. Then she would walk around the building and give them away to neighbors, she said. She has an associate degree from Paul Smith’s College in the Adirondacks and has been talking about starting her own business, Cookie Box Bakery, for years. Saturday’s Harvest Festival will be her coming out party. The festival — set for 11 a.m. to 4 p.m. at St. Nicholas Avenue and 116th Street — is organized by Harlem Park to Park and has been around for five years. The bake-off is only two years old. Wright is one of five finalists out of about 50 applicants who were selected for the bake-off, Evans-Hendricks added. Last year’s winner, Jean Chatman, was able to sell her zucchini bread at Harlem Shake. Chatman won first and second place in the competition. Since then her business, Chatman J. Cakes, has gotten a lot of attention. After getting the Harlem Shake deal, she started selling her Sweet Potato Cheesecake at Bistro BLVD. Last month the grocery store Garden of Eden asked to sell her cakes and pies during the holidays, Chatman said. Before being a professional baker, Chatman, 65, worked as a housing manager for more than 20 years. She baked as a hobby for family and friends but never took it seriously until she retired. A few years ago she began baking for senior centers around town and slowly built up more clients. Chatman found the recipe for the first-place zucchini bread in a Woman’s Day magazine — with some of her own twists added, she said. She entered the bake-off again this year to see if she can make it two in a row. Chatman even entered a third item to see if she can win first, second and third this year. “If you got a dream stick to your dream and never give up,” she added. That is exactly what Wright plans to do. She is currently baking out of her kitchen in her apartment on St. Nicholas Avenue but is looking into moving into an incubator, possibly in East Harlem, she said. She is excited to be one of the finalists and is just thankful to be given a chance. “If I win that’s great but if I don’t I’m just happy to get the exposure,” she said.